← So I’ve been creating, just not in the way you think…. My son Nash is 11 months old now and I’ve been preparing myself mentally for returning to working as a photographer as well as a mother. After I had our daughter Poppy I started working for Sage Photography producing newborn & maternity shoots, as well as family portraits. Some of my work can be seen at the following links here & here. It was a very different work atmosphere for me and one that I hope to return to, with great colleagues and a new environment to perfect my ‘baby portrait & positioning’ skills. It felt so great to be involved in an industry that was so relevant to the experiences I was having as a new mother. It made me realise how much of a different place I was in compared with five years ago. I was immersed in a maternal world of mothers, parents, babies, pregnancy & kids. While I have photographed all of these previously, I can now relate and understand in a way only another mother can. It was amazing to bring skills from both my professional and private life together so naturally and I think this has been evident in my success in making heart melting imagery. I’m proud to be a mother and embrace all the challenges, changes and joys it offers me in life. I also feel that through my photography I have something to offer other mums and I’m loving the position I find myself in regarding this. I want to celebrate all things maternal – pregnancy, birth, partners, mums, breast feeding, families, babies, kids, siblings – and I want to photograph it all! I had already discovered my interest in documenting Birth Stories but due to my own children’s nightly feeding demands I have been unable to partake any opportunities. However, the time feels right for me to pursue this line of work now, and in the following few weeks I’ll be putting together some packages for the above mentioned subjects for your viewing, including all varieties of portraits and most excitingly Birth Stories. I couldn’t think of a better opportunity to begin my maternal themed offerings other than by celebrating Mother’s Day! This is a fantastic opportunity for me to photograph your little ones and help you to give your Mum an individual and affordable gift. 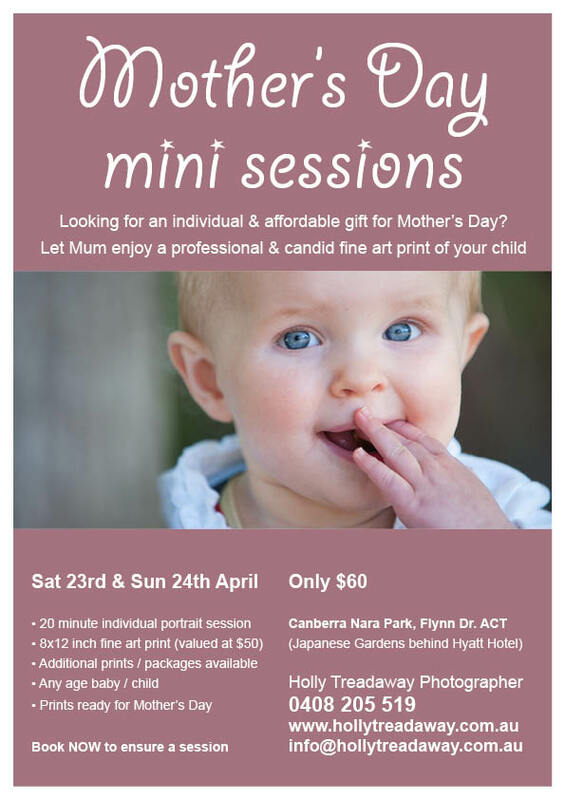 This coming long weekend, 23rd & 24th April, I’ll be delighting in photographing adorable little faces in my Mother’s Day mini sessions at Canberra Nara Park (Japanese Gardens) on Flynn Drive, behind the Hyatt Hotel. Mother’s Day falls on Sunday 8th May, and all mini session participants will be receiving their 8×12 inch fine art print in time to give it to Mum. Of course additional prints are available or if you cannot make the specified dates then gift vouchers for portrait sessions are also an optional gift for Mum this year. If you or anyone you know would be interested in any of the portrait sessions, Birth Stories or upcoming Mother’s Day mini sessions then please share this post, email or call to ensure a spot is reserved for you and your little ones. I look forward to meeting some wonderful parents and capturing some beautiful little faces.